In the surroundings of the legendary Ceiba de Ponce, broken pieces of indigenous pottery, shells, and stones were found to confirm the presence of Taino Indians long before the Spaniards that latter settled in the area. Also known as kapok and silk cotton tree, the Ceiba is Puerto Rico’s official national tree. 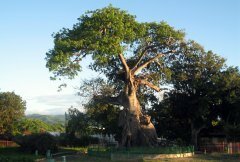 Its scientific name, Ceiba pentandra, comes from a Taino word pronounced say-bah. One of the largest trees in the American tropics, it can reach heights of over sixty meters and in hot, wet and sunny environments can grow as much as three meters in a year. The wood is exceedingly lightweight and easily worked. However, because it lacks durability and is susceptible to insects and decay, it was mostly used for the construction of large canoes (another Taino word) by the indigenous inhabitants of the region. Its fruit produces a fiber which is eight times lighter than cotton and five times more buoyant than cork was thus used as the floatation for early life preservers. In addition to these attributes, the fiber is totally water repellent, has a low thermal conductivity and is resistant to rot. Before being replaced by cheaper synthetics, insulation materials, mattresses and pillows also used to be stuffed with the Ceiba fruit fiber. Nowadays it has been discovered that its absorption capacity is significantly higher than that of the polypropylene material normally used in the cleanup of environmental oil spills. Renowned Puerto Rican painter Francisco Oller’s first impressionist landscape masterpiece (1888) graciously depicts La Ceiba de Ponce , one of the many treasures at Ponce Art Museum. Now converted into a passive park, this emblematic 400 year old tree still stands in majestic defiance of the neighboring urban blight that threatens to crowd it out. 787.843.2512 – OPEN 7 DAYS/WEEK (8:00am-4:30pm) – FREE ADMISSION.